Fenestra Winery was created by the Replogle family on the historic Ruby Hill property and in 1980 occupied the century-old George True Winery building on Vallecitos Road. The old building had been badly neglected. The Replogles hauled away tons of trash and installed a new roof and strengthened the building. Now part of the Ruby Hill development, (the Replogles lease the building and surrounding grounds) which includes a Jack Nicklaus designed golf course, homes and 900 acres of vineyards. The winery building has been refurbished and vineyards have been planted around the winery. The winery specializes in classically balanced, award-winning wines from primarily Livermore Valley grapes. Livermore Valley's first boutique winery, Fenestra Winery is celebrating 34 years of fine wines. OWNERS: Lanny and Fran ReplogleWINEMAKER: Aaron Luna Fenestra Winery, located at the entrance to Livermore Valley just off Hwy 84 in the southwest corner of the Livermore Valley, is usually a first or last stop of your tour of Livermore Valley wineries. It is one of the older wineries in Livermore Valley and perhaps one of the best loved. The Fenestra Fanatics, the wine club at Fenestra, are truly fanatical about their winery and your visit will find these Fenestra lovers helping out at the tasting room during the weekends and their events ready to share with you their love for these wines.What draws out such passion for a local winery? Well, many will say it is the quaintness of this century old winery building and the history of Fenestra itself. Some will say it is the great variety of wines served to visitors every weekend, often 20 or more different wines are available for tasting. Others might say the great selection of Spanish and Portuguese varietals available at Fenestra, a selection of obscure varietals that you dare not find elsewhere. In any case, it is time for you to check out Fenestra and see if it is also your favorite winery in Livermore.San Jose State chemistry professor, Dr. Lanny Replogle, first opened Fenestra in 1976, putting his chemistry science to the art of winemaking. Lanny says, “As I recall, there were only 5 wineries at that time: Wente, Concannon, Villa Armando, Stony Ridge and Fenestra. I was still teaching Chemistry full-time at San Jose State University, and we were living in San Jose. We moved our winery to our present location in 1980. We have seen remarkable changes in Livermore Valley with the planting of new vineyards and the emergence of new wineries.” In 1980 Fenestra moved to its present location, the century-old George True Winery building on Vallecitos Road.Pulling up to Fenestra, you are surrounded by vineyards, and in the distance you will spy a few mega-mansions scattered among the vines. The old rustic barn with vines growing up the sides hides many surprises from the new solar panels on the roof to that bustling tasting room around back in the basement. Enter the barn doors and step forward to the hostess to start your tasting experience. The tasting room crew makes you feel like you were just invited to their family gathering and treat you like old friends. With this eclectic selection of varietals and reasonable prices you will be sure to walk home with a favorite.They will start you off with such wines as a Torrontes or Verdelho from Lodi or, for the red wine lovers, how about a Tourvanillo, Alvarelhao, or Touriga? Don’t worry, you will also find many familiar varietals such as Chardonnay, Pinot Gris, Merlot, Cabernet Sauvignon, Cabernet Franc, Malbec and Zinfandel. But this is your opportunity to try some interesting Portuguese and Spanish varietals and get a taste of the old world. 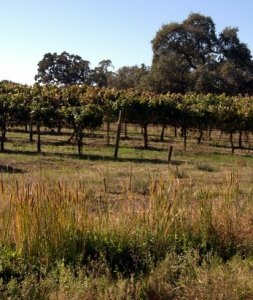 It is an adventure to visit Fenestra Winery.Feel free to bring a picnic lunch and spend some times at the picnic tables behind the winery along the creek, or, if you prefer, you could take your tasting outside and enjoy some fresh air. Stop by Fenestra and make it your favorite winery too! of wine and barrels. A creek and vineyards edge the picnic area, which has a lovely lawn. The ambiance is that of a no-frills, country winery where the owners greet every visitor as a welcome guest, and the guests soon become old friends. Open Saturday and Sunday Noon to 5 p.m. I always thought a dessert wine would be to sweet for me, usually in the past I wouldn't even taste one. Then I found what I call the gateway port. It literally is so good that I hesitate for a moment when I think about revealing this gem, I poured tastes of this 2004 port from Fenestra Winery at the San Francisco Flower and Garden show and every single person that tasted it wanted more. It is the finest chocolate flavor I have ever tasted in a beverage, including hot chocolates, or coffee. My wife and I recently visited during their Wine & Soup Weekend event and had a great time. The day was a bit cool which put the event inside their building. By mid-day, it was elbow to elbow, which helped keep us all warm - along with the wonderful Soup, I might add! Their wines were wonderful, as usual, and many of the soups contained wine in the mix. Good pairings and pleasant staff - a treat for us both. We made a few new friends and that makes it all the better. I recommend visiting this winery - their events are a fun time.